ARRIVAL is the science fiction film for people who avoid them because they see them as vapid, effects-driven, plot deficient time-drains. Fans loyal to the genre will also embrace the film, which is about a linguist who is tasked with translating the language of recently landed aliens, in order to open inter-species communications. Auteur director Denis Villeneuve of Oscar-nominated SICARIO and INCENDIES is at the helm. He has begun, to the advantage of movie lovers everywhere, straddling the line between indie and blockbuster frameworks. He is frequently in the press about his current project BLADE RUNNER 2049, which, even before its release, has made him the darling of sci-fi geeks the world over. In ARRIVAL, there is a depth to the lead character’s personal journey, however, and larger messages about acceptance, tolerance, and compassion, that will bring the art house film devotees into his fold. Amy Adams plays Dr. Louise Banks, a linguist who gets recruited by members of a military task force. They are attempting to make sense of what the twelve oblong-shaped spaceships are doing floating just above the ground in various locations across the world. She and physicist Ian Donnelly (Jeremy Renner) are the American contingent trying to make contact with the aliens, and time is essential as other countries are deciding if the aliens pose a threat worthy of starting military action, which may lead to the destruction of the planet. One of VIlleneuve’s best qualities as a director, is he can create meditative, deep, meaningful scenes that also build tension or intensity. There is no lack of forward action in ARRIVAL, it’s just built from putting together moments of personal experience that build character, and the assembly of costars as they energize to solve problems, and try to save the world from self destruction. ARRIVAL requires thought, concentration, and is more a brain teaser in the vein of MOMENTO, than any sort of sci-fi movie you might know other than perhaps SOLARIS. The single most compelling and notable aspect of the film is the unwavering intelligence and insight, and the nerviness and instinct of the female lead character. She has more than a little in common with GRAVITY’s Ryan Stone and Murph of INTERSTELLAR. Adams’s Dr. Banks is haunted, preoccupied, obsessive, and driven, and she is all that, as well as a genius, with a growing understanding of the aliens that goes beyond anyone else in the film. She is the one who must solve the puzzle that saves humanity. She does so without compromising her individuality or whatever gender-assigned qualities she may reveal as part of her personality. The story does not unfold in a linear way. Time is bent and manipulated to reveal the whole picture. It is done in such a way that only at the end is the true nature of the film, and what it says in terms of bigger messages, exposed. Audiences will be considering how it might speak to them personally, and how it speaks about humanity needing to work together in peace, for a long time after the lights come up. In fact, there’s an argument to be made for repeated viewing. 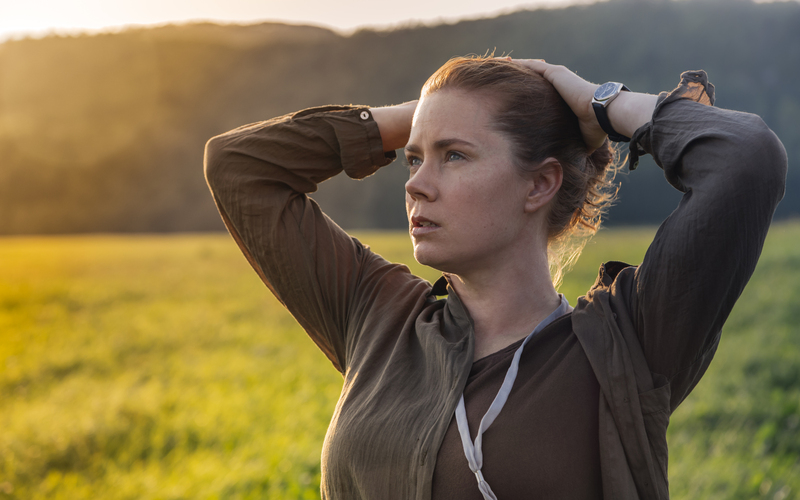 In these post-election days, when women need to be reminded there are places they are represented in a powerful, truthful way, ARRIVAL offers them a story and character that does just that.